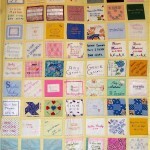 You are about to scroll through sections of the A Little Lifetime Foundation Remembrance Quilt (viewed on yellow background). This beautiful work of art was put together to mark the 10th Anniversary of A Little Lifetime Foundation (formerly ISANDS) and to help the campaign for a stillbirth register. 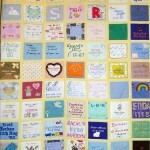 It played an important and meaningful role in the campaign as most of the parents who made a patch for the Quilt would not have had State recognition for their baby’s short life. 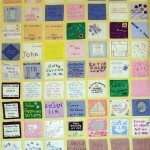 The patches were sewn together by a Team of Quilters headed by Ann Moloney in Cork (Ann was a member of the old ISANDS committee in Cork and is now retired). 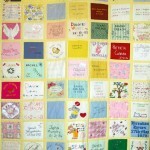 The Quilt has over 700 patches on it, each patch made lovingly to remember a baby, a life. 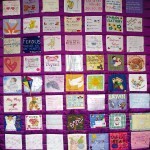 Parents and family members travelled from all over Ireland to present their patch in memory of their baby. 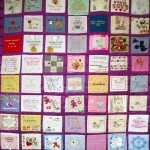 Patches came from America, Canada and Holland in memory of a baby born in Ireland. There are so many beautiful stories attached to each patch; stories waiting years to be told. 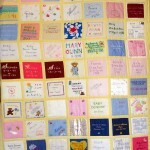 Some of the patches made form pieces of wedding dresses and family Christening robes. 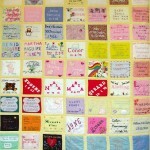 One patch made by a lady, from the handkerchief of her late husband to mark the life of her baby born 52 years earlier. Another patch which can be seen on the Quilt is dated 1915. Most of the parents who made patches were parents bereaved long ago. Parents, who had little or no acknowledgment or recognition of their experience were given an opportunity to make a patch to remember their baby. Each patch made is as unique as the child that it represents. 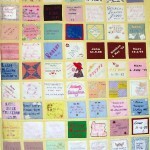 The finished Quilt measures over forty foot (40’) in length and has an eight foot (8’) drop. You may be aware over the last couple of years the difficulties for parents and families who were affected by the Organ Retention scandal. 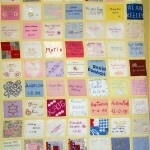 As a gesture of acknowledgment A Little Lifetime Foundation had a special patch made to add to the National Quilt. We remember these babies with love and hope that their families find strength and support as they try to come to terms with their grief once more. The patch has flowers and leaves to mark the four seasons of the year, to symbolise the significance of a season to most parents, a season when their baby was born or when he or she died. 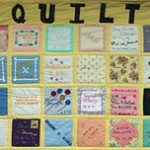 We have been asked many times if patches could be added to the National Quilt and unfortunately this is not possible. However a New Quilt is in the making. Parents and family members and friends are once again given the opportunity to make a patch in memory of their baby. Some beautiful patches have already been received, are already sewn to sections of the new Quilt and can be viewed here on pages with purple backgrounds.